The Rexel Style Cross-Cut Shredder is suitable for home use and can handle up to 6 sheets of 70gsm paper at a time. It’s a P-4 security level shredder, which means it’s ideal for shredding highly sensitive or confidential material. The 7.5 litre bin can hold up to 25 sheets of 70gsm paper and has an easy to empty opening front. 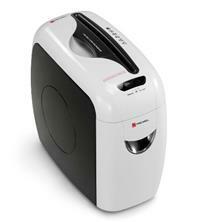 Plus, this shredder can handle a range of material including paper, credit cards, staples and paperclips. The Rexel Style is compact enough to easily fit under a desk – and it looks stylish too with its black and white design and rounded edges. Other features include auto start/stop, reverse and overheat protection and the shredder also comes with a 2 year warranty. The Gadget Show named the Rexel Style 3rd best in a test of 20 home shredders.